This U-boat crewman looks thoroughly unpleased with the situation. 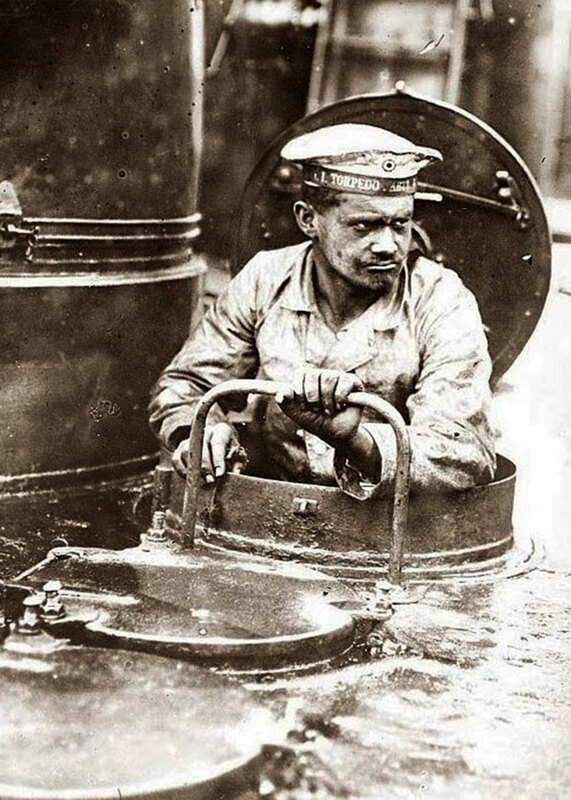 This torpedo-boat crewman looks thoroughly unpleased with the situation. Patrols could be anywhere from 3 weeks to 6 months and during that time the crew were not able to bathe, shave or change their clothes regularly. The space to live in was small, the working condition were really bad, fumes and smog everywhere. It’s not difficult to imagine how unpleasant life would be for someone who had not taken a bath or had a proper change of clothing for six months. However, the crew of German torpedo-boats were treated like royalty when they docked because of the difficulty of their jobs. Upon docking, the crew filed out on shore leave and were generally given whatever they wanted while a cleaning crew scrubbed the submarine from top to bottom. The crew of an torpedo-boat was made up of specialists and seamen. Specialist crew, such as radiomen, torpedomen and machineman were responsible for the operation and maintenance of equipment aboard the boat. Other general duty tasks such as loading torpedoes, standing watch on the bridge, operating deck guns and housekeeping activities were performed by the seamen. Their workload was divided into several shifts, with the seamen working in three 8 hour shifts – one for sleeping, one for regular duties and one for miscellaneous tasks. Specialist crew, such as the two radiomen had three four-hour shifts between 8am and 8pm, and two six-hour shifts during the night. Standing on watch duty during stormy weather was frowned upon by the crewmen. The harsh environment of the North Atlantic meant that icy waves constantly swept over the conning tower, completely submerging the boat and the watch crew for brief periods. They were issued with special foul-weather coats, but these did little to keep them dry. In addition, crewmen had little chance to dry their clothes during a patrol. The watch crew was secured by safety lines to keep them from being washed overboard. Crew habitability ranked very low on the priority list of German torpedo-boats. Fresh water was limited and strictly rationed for drinking, especially when they had opted to fill one of their water tanks with diesel fuel to extend their operational range. Washing and showering were not permitted, with all activities of shaving, laundry being postponed throughout the entire duration of the patrol. They were allowed only the clothes on their backs and a single change of underwear and socks. To remove salt from their skin caused by seawater exposure, crews were issued with special saltwater soap, but this was unpopular as it left a disgusting film on the skin. To control body odor, a deodorant was used. Crew space was at a premium with each crew assigned one locker for personal belongings. And in order to maximize the limited space, the forward torpedo room also formed the crew quarters. Privacy was non-existent. Bunks were laid out on the right and left of the busy walkway, and human traffic was common with crews getting forward and backward of the elongated torpedo-boat. Only the captain was afforded any privacy. Made up of a simple curtain, it could be drawn over the captain’s quarters, but he still could hear what was going on the outside. The captain’s quarters was placed next to the control room and radio room, so he could quickly respond during an emergency. Food aboard the boat was another interesting topic. They brought the best foods available with them, including fresh meat, sausages, bread loaves, fresh fruits and vegetables, but the small refrigerators meant that food spoilt quickly, especially in the damp environment of a toperdo-boat. Very soon, fresh loaves of bread would sprout white fungi, which the crews promptly nicknamed as “rabbits”, due to the white fuzzy appearance. By that time, food consisted mainly of canned goods supplemented by a soy based filler called Bratlingspulver. Issued by the military, the crew unkindly referred to it as “diesel food”, due to the constant exposure of diesel exhaust that surrounded them. Even going to the toilet was no simple feat. There was only one toilet available until the food stuffed in the second toilet had been eaten up. With forty to fifty crews sharing the same single toilet, unpleasant emergency situations were sure to occur. The flush system consisted of a hand pump, where the contents of the waste was hand pumped into the ocean after each use. Using the toilet was prohibited when stalking an enemy as it was feared that the noise of clanking metal or floating debris would alert the enemy to the presence of a torpedo-boat. Long war cruises took its psychological toll with many crews painting a vision of emptiness, except for the occasional marine life for company. Months would pass and there were no trees, no hills and no landfall where one could place his feet, except on the deck of the submarine boat. Except for the excitement when hunting an enemy ship, or when being hunted themselves, crews passed time by listening to a record-player built into the boat, or by playing cards and organizing some weird games to keep their minds occupied.